The Colosseum, named also "Anfiteatro Flavio", constructed in command of the emperor Vespasino in the honor to magnitude his empire, and inagurated by his son Tito,in 80 BC with celebration that lasted 100 days. The name Colosseo comes propably from a big brone statue that is around 38 meters high and its name is "Colosso", that Nerone wanted to look like his image near Domus Aurea. The work that represented the emperor as the ancient god Apollo,to be remebered as a great mind, with the extraordinary dimensions, prestige and charm that had the other ancient symbol: the Colosseum of Rodi. Emperor Adriano moved the statue near the amphitheater and then first modificated its features to make it look like different emperors and then the "corona di raggi solari" was added , to be like the god of Sun. But it was however just in Middle Ages that splendour imperials and aristocratic people,started to call the Colosseo with the name "Anfiteatro Flavio". 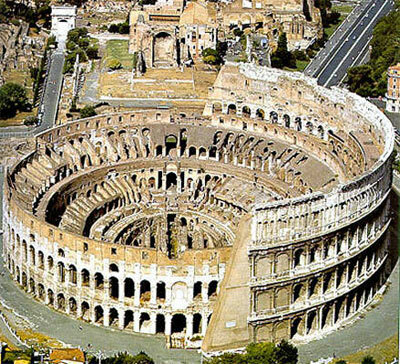 The Colosseum, originally known as the Flavian Amphitheater, or simply as Amphitheatrum is the largest and most important Roman amphitheater that can hold up to 50,000 spectators.. The Colosseum, designed by Rabirio or maybe Gaudenzio, was a place of the fights between gladiators, executions, naumachie and hunting shows. About 80000 spectators were watching fights that could last from the daybreak till the sunset and also utill the night when the gladitors were illuminated using torches. From history it seems that the public liked the most the fights of the dozen gladitors invented by the emperor Claudio, gave "sportule". All the religious holidays, anniversaries and military victories were celebrated durig the imperial epoch with challenging the gladiators. To defend spectators from the ferocious beasts, the the metallic net arised , while during the bright or rainy days, public was protected with the big blue "velario" with yellow stars steered by the team of sailors from the Capo Miseno and Ravenna fleets. In any case, in 313 AC emperor Costantino procliamed Christianity to be the official religion of the impire , prohibiting of course the murders of Christians but also fights between gladiators and hunting shows. 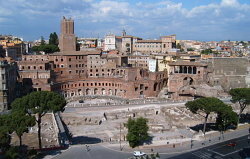 In the next centuries Colosseo became first the cemetery, and the the fortress named "Frangipane" and in the end the quarry for the buliding material. 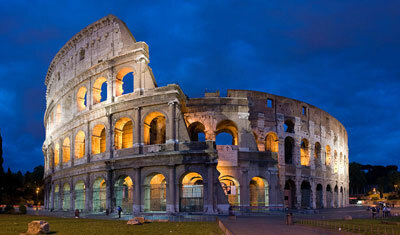 Join this three hour walking tour and experience 2753 years of ancient ruins and intriguing history. 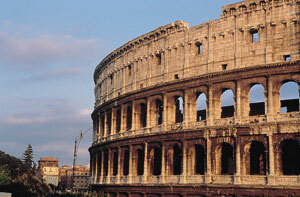 Visit the best known monuments of Rome such as the Colosseum, Roman Forum, Capitoline Hill, Trevi Fountain, the Pantheon, and Piazza Navona, as your professional guide brings the ancient city of Rome alive for you.